We pride ourselves on offering the most advanced technologies and treatments available, more commonly seen at elite athlete level where injury time has to be reduced significantly to allow athletes to perform. Specialising in sports and general injuries with a client age ranging from 8-98, we are here to help you return back to full functional fitness. Guy founded East Devon Sports Therapy in 2010. 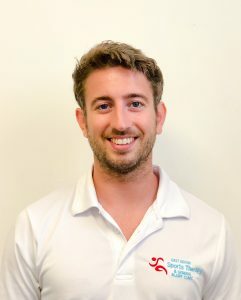 He studied a 3 year degree course in sports therapy at Marjon, Plymouth and is a fully registered member to the society of sports therapists. He has had the opportunity to work with a variety of sporting athletes and the general public to gain a high level experience with different injuries and scenarios. To date, Guy has worked with and treated; England college and university rugby, football, netball and hockey players, Team GB rowers future and ex-Olympians, Exeter City FC, European badminton champions, commonwealth athletes, team GB athletics, team GB swimmers and general injuries through activity, such as lower back pain, sciatica and neck pain. Guy has played badminton at a high level, gaining sponsorship and personal coaching from the ex-world champions. From this he understands how recovering from an injury needs to be as quick and effective as possible. Continuing to further his knowledge and education, Guy continuously attends courses and training conferences to ensure the latest and most effective treatments are available for his clients, ensuring that everyone finishing treatment, leaves feeling better than they did prior to injury. 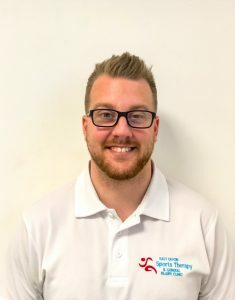 Scott qualified as a Sports Therapist in 2010 alongside Guy at Marjon University and is also a fully registered member of the Society of Sports Therapists. Scott has worked with numerous clubs including; Torquay United FC, Paignton RFC, Dartmouth RFC and Dartmouth AFC. In 2014 he gained the opportunity to work with the South African Rugby Union national team and the Jacksonvile Jaguars NFL team gaining valuable experience at the highest level. As well as his work in the field of Sports therapy, Scott has experience in running a functional strength and conditioning facility, coaching athletes on safe and effective training methods to improve performance. He has great understanding on the whole rehabilitation process, from treatment table to sport specific and return to fitness protocols. Scott is a keen sportsman himself having played rugby, football and golf. He currently plays rugby for Teignmouth RFC in the Tribute South West 1 West Division. Scott joined the clinic in 2015 adding his expertise and experience. He is a very motivated and keen therapist ready to help your injuries in rehab and prevention. 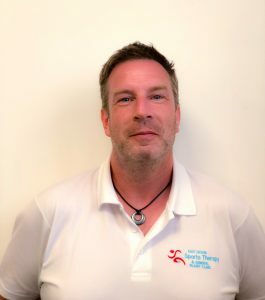 Gary qualified with a Sports Therapy Diploma before furthering his knowledge in 1999 completing a BA degree in Sports Studies at University Chichester. He also hold s experience in other specialist areas such as life guarding, emergency first aid, sports massage and fitness instructing. Gary is a well known and friendly local fitness instructor, who you may recognise from various local gym establishments including LED leisure centres, Seaton Heights Gym and the Seaton Camp Site Gym, where he also worked as a lifeguard for the pool. Gary takes a keen interest in sport on a personal level also, playing basketball at county level in the past and enjoys participating in many more including charity cycle rides. Gary is a highly motivated individual who will help you along each step of your rehab using the AlterG Anti-Gravity Treadmill.